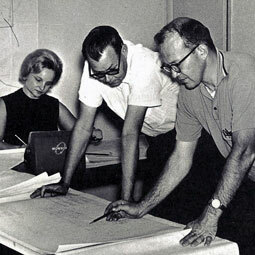 Company History | Poly, Inc.
Poly, Inc. has been continuously engaged in the practice of professional engineering since its founding by a small group of engineers in Mobile, Alabama in 1959. The company began with a staff of six providing services primarily for municipal clients. 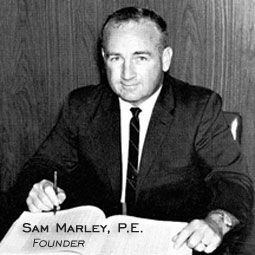 In 1965 one of the company’s founders, Sam B. Marley, opened a branch office in Dothan, Alabama. That office consisted of a single engineer, a secretary, a draftsman, and two engineering technicians. In the ensuing years the Dothan office grew tremendously, becoming independent of the Mobile office, (which is now closed), in 1979. The initial staff of six has expanded to more than 45 multi-disciplined professional engineers, architects, environmental consultants, drafters, construction inspectors, surveyors and support staff in the main Dothan office. In 1970 POLY opened a branch office in Fort Walton Beach, Florida and another in 2008 in Blakely, Georgia to better serve the needs of its growing client base in Northwest Florida and Southwest Georgia. This dedication to local and regional governments is still evident as POLY currently serves over thirty city and county governments and agencies in Southeast Alabama, Northwest Florida and Southwest Georgia. In 1983 POLY was retained by the Alabama National Guard to design and oversee a tank training range on Eglin Air Force Base. Beginning with that initial range project, POLY expanded its expertise to become one of the leading firms in the United States in the design of all types of training range facilities throughout the country and overseas. In 2014, POLY continued to grow by acquiring CFM Group, LLC in Tuscaloosa, Alabama. This enhanced the company’s civil, environmental, planning, and surveying line of services in northern Alabama. Since its founding, CFM performed engineering services including including civil design, transportation design, highway design, traffic design, hydraulics, water treatment systems, sanitary sewage systems, planning, geotechnical evaluations, subdivision design, pond design, economic mineral evaluations, grading and erosion control plans, and project and construction management. This office was rebranded from CFM to POLY in 2017. Poly, Inc. was founded on the driving principle of seeking and building partnerships with clients. This company philosophy has proved successful in that many of our clients have been with us for over five decades. Over 85% of our work is with repeat clients. These kinds of client partnerships are built by placing the client’s interests first in arriving at efficient and effective design solutions.